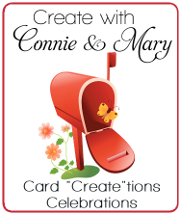 This card is celebrating Day 4 of the Create with Connie and Mary Card “Create”tions Celebrations Preview Week! We have another FANTASTIC design team member giving away BLOG CANDY? Who is it you ask? Well head over to Create with Connie and Mary and find out! And while you are there, subscribe to Create with Connie and Mary Card “Create”tions Celebrations – we go LIVE on Sunday! Do you have a favorite color comb? This is mine (HINT…showing it tomorrow too!). When I need a ‘happy’ card I tend to want to use these colors: Real Red, Pumpkin Pie, Pacific Point. I don’t know what it is about these color but they just say ‘happy’ to me! Whisper White – 3 3/4 x 5 1/2 – cut left side on diagonal. My bottom is 3. Hello You framelit – cut out you in Basic Black, add to panel. Basic Black – 5 3/4 x 5/8, add along diagonal and trim to fit. Add some Basic Rhinestones to finish off the celebrating! So head of to Create with Connie and Mary and find out which designer we are featuring and then head to her blog and leave a comment to be signed up for her blog candy. This entry was posted in Create with Connie and Mary, Spring Mini and tagged Crazy About You, Snuggles and Smooches. Bookmark the permalink.